I’m surprised I can still eat them, still enjoy them. Their color is so vibrant, taste so pleasant and unassuming. However, an event concerning a bowl of peas almost ruined them for me. An embarrassing moment. But I have had so many subsequent gaffes and blunders that this one, while still remembered, pales in comparison to its later counterparts. I was newly dating my husband and invited to dine in his childhood home with his parents and sister’s family. There were seven of us in total. 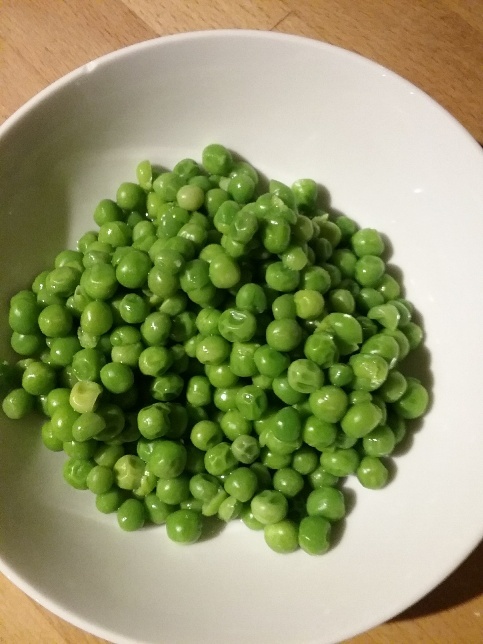 A bowl of peas, the size of the one pictured here, that is to say approximately 5 inches in diameter, was set on the table above my plate. A rather diminutive dish in my recollection. I, being of sturdy stock and healthy appetite, proceeded to dip my spoon into the bowl and eat. After the third or perhaps, fourth spoonful, my awareness sharpened and my face reddened. I looked around and realized (through the teaching gaze of judging eyes) that I was eating from the serving bowl meant for the entire family. It’s hard for me to write this without cringing. I do it for you dear readers. It is but one of so many similar stories of my life. It’s a wonder I can get up each morning, let alone enjoy any peas of mind! How funny!! Why is it that our most embarrassing moments make for the funniest stories? Thanks for sharing and adding humor to my day! Thanks, Kathy. It’s good to laugh even when it’s at our own expense! Helen! I literally laughed out loud at this one! thank you for the delightful story and your willingness to share and reveal yourself to us! I laughed out loud! You are the best, Hel! My most embarrassing moments are a lot worse than that…. Thanks, you know I have a lot more in my arsenal. Great story from a great storyteller!